The last of these remarkable historical crime thrillers is aptly set at the start of Bernie Gunther’s police career with Berlin’s Murder Squad, the Kriminalpolizei. It is an origin story, as well a mirror to be held up against the political turmoil of our own contemporary times. Above all else, it is a melancholic narrative, a reflective work that provokes deep thought in the reader as only a piece of high art can; because Philip Kerr’s final novel is just that, narrative artistry. Berlin 1928, the Nazi regime is gathering momentum and power in a desperate nation, one humbled by that great war, the one that Bernie Gunther survived where many died in the muddy trenches, and the clouds of gas that the infantry men had to traverse. Gunther is living in a rooming house that he shares with an overbearing landlady and assorted misfits including an Englishman named Rankin. Gunther’s detective skills have been noticed by his superiors in the Berlin Police; and so in consequence, he finds himself promoted from the Vice Squad, to the Murder Squad. As ever, the narrative is peppered with observations and dialogue that could have been torn from the pages of Raymond Chandler, for Bernie Gunther shares the world-weary cynicism of Philip Marlowe. There is much wit within these pages, but that is matched by the oppressive darkness of the story. Gunther is assigned to track down a serial killer who is hunting the scalps of prostitutes, many who are women trying to earn a little money just to survive, in an economically ravaged city. High art rubs shoulder to shoulder with the unspeakable cruelties inflicted upon the peoples of this city. There is theatre, there is cinema, music hall as well as drinking, drug taking and sexual depravity that attracts people to its dark streets, and eponymously gives this novel its title. The press daubs the serial killer as ‘Winnetou’, a reference to the native American hero of the western novels of German Author Karl May. As the scalps of prostitutes start to litter the dark alleys of Berlin, the attention of a local Gangster Erich Angerstein is piqued, and who soon unofficially joins Gunther in the hunt for ‘Winnetou’. Gunther’s bosses at the Kriminalpolizei soon tell Gunther to drop the case as a second serial killer appears on the scene, one whose victims are more politically incendiary than dead prostitutes, namely beggars, former WW 1 veterans with missing limbs who are being shot at close range by a person who calls himself “Dr Gnadenschuss”, a self-styled vigilante cleaning up Berlin’s streets of these human reminders of Germany’s humbling in the Great War. Gunther believes there is a connection between these two serial killers, though his superiors are sceptical as both serial killers deploy divergent Modus Operandi. ‘Winnetou’ uses a knife to stab and then scalp his victims (all women, apart from a Transvestite male dressed as a woman), while “Dr Gnadenschuss” uses a handgun fired at point blank range into the faces of disabled WW 1 veterans (all male). As ever the political situation casts a thick film over the investigation, especially as Gunther’s bosses Weiss and Gennat need Gunther to drop his interest in the dead prostitutes and focus soly on “Dr Gnadenschuss”, as the killer of the disabled veterans appears to be a sympathizer of the growing Nazi movement. Gunther is unconvinced but has to follow orders, which entail him going undercover, disguised as a disabled veteran akin to a ‘tethered goat’, bait to draw out this “Dr Gnadenschuss”. It’s dangerous work, but Gunther soon finds an intimate friendship in the shape of an actress named Brigitte as compensation. Gunther [and the reader] receive an amusing lesson on the historical (and dangerous significance) of whistling. Reading a Bernie Gunther novel gives the reader subtle insights into the fabric of our experience of reality, both philosophically as well as historically, but all the while entertaining as these novels inform and provoke thought as the pages turn. And so, Philip Kerr weaves a dark tale of a police investigation contrasted against the horrors of the growth of the popularism, the Nazism that like a fungus is transforming Berlin into a rancid cesspit of depravity; one deep in the heart of the Weimar Republic. Real-life characters such as Lotte Lenya, Kurt Weill, and others pepper the proceedings, as well as the mention of Fritz Lang, which all add to a surreal flavour to this narrative. In fact, those familiar with the background to ‘The Threepenny Opera’ with MacHeath [aka ‘Mack the Knife’] as well as the films ‘M’ and ‘Metropolis’ as well as the art of that era, of that Berlin, will find much to admire in this extraordinary novel. Though at its core, the great attraction of these adventures of Bernie Gunther is his cynical world-view, his survival instinct and his snappy observations with darkly-amusing dialogue. Mention must also be made of the array of secondary characters that striate the journey, each deftly smeared onto the page, not with detailed description, but with concise narrative brushstrokes that make them stand erect as if they were sitting in the same room as the reader. The climax has an air of melancholia, for though satisfying, the reader is forced to understand that this is the last outing for Bernie Gunther for it was written under troubling circumstances from a writer at the height of his powers. It is published posthumously, with an enlightening introduction from fellow award-winning crime-writer Ian Rankin. 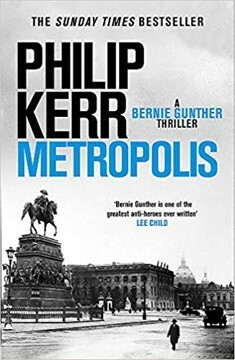 When you get to the end, it makes you re-read Rankin’s introduction and to reach out for March Violets, the first of this exceptional series of novels from Philip Kerr - because Metropolis is the Alpha and the Omega of the fictional detective, Bernie Gunther. Though Philip Kerr wrote over 30 novels in his career, spanning many sub-genres, it will be the 14 novels that featured Bernie Gunther that he will be remembered for, his legacy as a novelist.